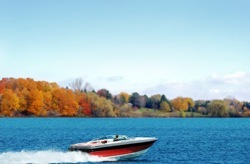 Boating Accidents | Nashville Boat Injury Lawyers The Law Offices of John Day, P.C. At the Law Offices of John Day, we are experienced with the laws and regulations governing boaters because we are boaters ourselves. Weather permitting, John Day can be found on Tim's Ford lake on most weekends. And for more than 80 years, we have been firmly committed to protecting the rights of injury victims including those involved in boating accidents. Tennessee is home to roughly 925 square miles of lakes and rivers making it a wonderful play ground for boaters. But unfortunately, a fun day at the lake can turn into a tragedy because of someone's carelessness. According to the most recent data from the Tennessee Wildlife Resource Agency, there were 9 boating fatalities and 131 boating injuries on Tennessee waterways in 2010. Inattentive boaters who simply fail to keep a proper lookout were the number one cause of boating accidents in 2015. Other common causes are intoxicated operators, reckless boaters and inexperienced boaters. In Tennessee, an operator is considered impaired if their BAC is .08% or greater, and 5.1% of the boating accidents in 2015 were attributable to drugs or alcohol. Another major cause of boating accidents is reckless operation which can take many forms but is generally defined as any act which endangers others or property. Finally, inexperienced boaters can pose a hazard to themselves and others on the water. Under Tennessee law, any boater born after January 1, 1989 must successfully complete a boating safety exam, but some young boaters fail to do so and they simply do not know the basic rules of the waterways. If you or someone you love has been the victim of a serious boating accident caused by someone's negligence, one of our experienced boating accident attorneys can help you hold the other driver and all other responsible parties accountable. For instance, under appropriate circumstances, the owner of the boat may be liable for the accident even if he or she was not operating the boat at the time of the accident. Our goal is simple: to get you the maximum compensation possible for your losses. We have recovered more than $100 million dollars for our satsified clients and we would like to help you too. To schedule a thorough, no-obligation evaluation of your case with one of our boat accident attorneys, please contact us online or call us at 615-742-4880 or 866.812.8787. The initial consultation is free and we handle all boating accident cases on a contingency basis which means you do not pay us a dime unless we get money for you. And, we advance all case expenses so you are never out of pocket any money to pursue your boating accident case. For more information on our fees and expenses, click here.